Training Organisation – First MOU! We’ve recently brought news of our officially launched registered training academy, AIMAC, and hot on the heels of the launch we are delighted to annouce the first Memorandum of Understanding involving the academy as we look to make first-class healthcare administration education accessible to all. At the launch party last Wednesday our CEO, Margaret Faux, penned a mutually beneficial agreement with HealthMinds Founder, Dr Chinmaya Chigateri. Images: Top left – Dr Chinmaya Chigateri and Margaret Faux congratulate each other on the agreement. Top right & bottom left– Dr Chinmaya Chigateri and Margaret Faux signing the deal. 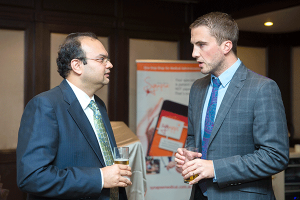 Bottom right – Dr Chinmaya Chigateri and Thom Soutter discuss the bright future ahead. HealthMinds is a healthcare company, in India, founded with a vision to improve the capbility of medical and healthcare professionals to do good research. The company moved from helping doctors and HCPs with data analysis on their research data to helping them do actual research. In the year 2017 the company decided to move into domain of Continuing Medical Education (CME) progams. HealthMinds is changing the CME landscape by taking the CME programs online to tackle the problem of access to such high quality development. The company aims to be at the forefront of medical research and continuing education in the near future in order to build a healthcare research ecosystem as well as improve patient outcomes. We see this ethos and disruptive solution as the perfect fit for our educational program as we share mutual aspirations to provide flexible educational development in the digital age to improve foundations of one of the biggest employers in the world, healthcare. 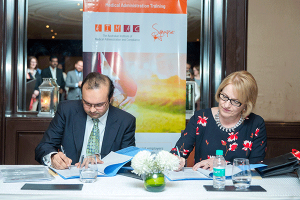 After the signing of the partnership, which will see the complimentary courses being promoted in tandem, Synapse founder Margaret Faux stated “this is an exciting moment for our training academy to be joining with a company who share our passion to make world-class healthcare training and education accessible to as many people as possible. Dr Chinmaya and his talented team will work with our educational team to improve health literacy and in turn patient outcomes. We look forward to supporting the growth of this relationship”. HealthMinds is a healthcare company founded with a vision to improve the capbility of medical and healthcare professionals to do good research. The company moved from helping doctors and HCPs with data analysis on their research data to helping them do actual research, thus leveraging its internal capability to do research. In the year 2017 the company decided to move into domain of Continuing Medical Education (CME) progams. HealthMinds is changing the CME landscape by taking the CME programs online to tackle the problem of access to such high quality programs as well as providing convenience to its already work heavy clientele. HealthMinds has also gone a step furthur to differentiate itself in the online CME space by using technology to make education more interactive such as the use of Augmented reality. It has already pioneered the online CME model in the Kingdom of Bahrain with the Bahrain Medical Society. 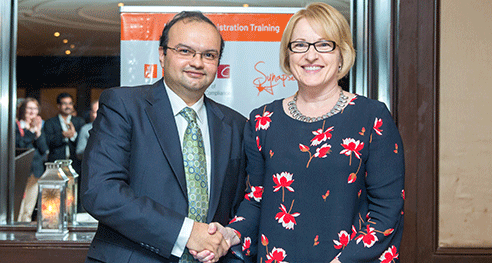 We are really excited to partner with AIMAC and Synapse to distribute their Healthcare Administrative courses in India. We feel that this is a strategic fit to our online CME portal, CME Master, where our focus was mainly clinical programs. Adding administrative programs onto the portal will provide an opportunity for doctors and HCPs in India to become well rounded professionals, both clinically and on the administrative domains. HealthMinds Consulting Pvt Ltd, Jubilee Building, 2nd Floor, Unit D, No. 45, Museum Road, Bangalore-560025 INDIA.